Another GSA Fashion Show draws to a close this week. But don’t fret, there’s still a couple of days to visit our collection of fashion show material which is part of the GSA Fashion Show 70th Anniversary Exhibition in the Reid Building until the 26th of March. Can’t make it? Simply email us at archives@gsa.ac.uk to make an appointment and view the material for yourself! Photo from Sheila MacDonald’s fashion show collection in 1977. 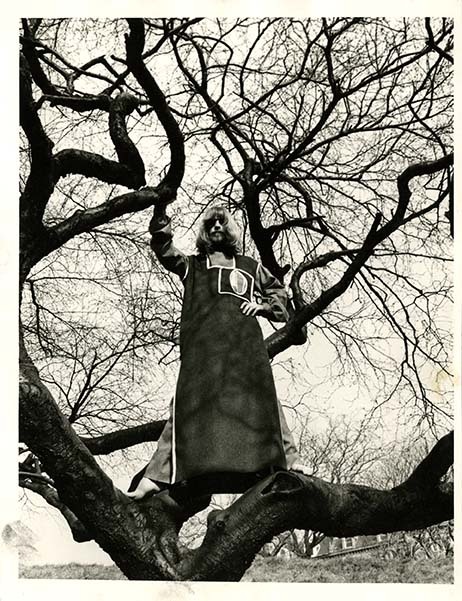 In the second instalment of these blog posts celebrating 70 years of GSA Fashion Shows, we will examine how the shows have evolved between the 1970s and the present day. Read the first instalment here. If you were previously involved in any GSA Fashion Shows and have any information or items that you would like to share with the Archives and Collections, please email the team at archives@gsa.ac.uk. GSA’s Haldane Building became a regular choice for events throughout the 1970s. Large-scale placement prints, embroidered motifs, oversized garments and costumes featured in these shows. From the mid to late 1970s the theme of the fashion shows, decided upon by the organising student cohort (usually from the 3rd Year of a 4-year course of study), directs event design. For the 1977 ‘Fashion Circus’ show, models paraded on a floor of sawdust and a gorilla costume featured. For 1978, the impactful visual identity of the show depicts a silhouette wearing a red carnation; this detail follows through to the programme, ticket and corsage worn by the show’s compere. The programmes from this period state that garments can be purchased from students via the relevant department. The Bourdon Building Assembly Hall, now GSA’s Library was also used for the event. 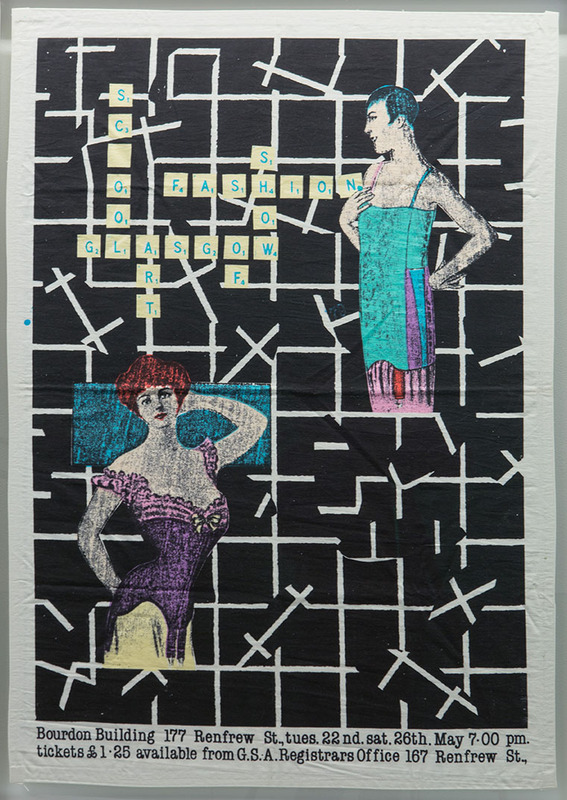 Poster for the 1979 Fashion Show by John Skinner. Poster has been printed on Fabric. 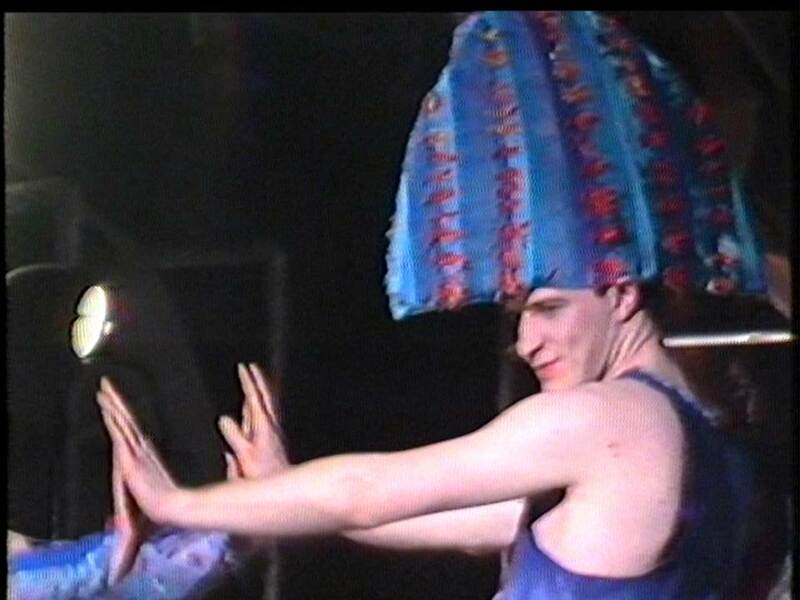 The first known audio-visual recording of the event is from 1982; this and other recordings (1984, 1985 and 1986) show a range of outfits from costumes to more wearable garments. Throughout this period shows appear to engage with topical, social and political themes, through performance-like presentations. The majority of 1980s shows took place in the Assembly Hall, the Students Union, indicating support for the event from GSA’s Students Association. Throughout the history of the fashion show the involvement of students from departments across GSA is apparent, particularly when associated with GSA’s Activities Week. Still frame image from the 1986 GSA Fashion Show film footage. This material is currently being catalogued by our Skills for the Future Trainee Jennifer Lightbody. Read Jennifer’s introduction to her project here. Photographs from the mid -1990s show backdrops, in front of which a mix of outfits are paraded. 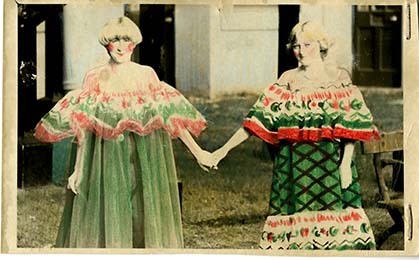 At this time, textiles at GSA was divided into ‘Printed & Knitted’ and ‘Embroidered & Woven’. During this period design aspects of the show became more integrated into the undergraduate curriculum. By the late 1990s, as build up to Glasgow’s year as City of Architecture and Design 1999, there was a shift in the scale of the show and large venues were used around the city. Themed ‘Morphogeneis’, the 1998 show included 40 collections, with projections of video works by GSA’s Interior Design students. In 1999 GSA’s textile departments were amalgamated into a single Department of Textiles combining embroidery, weave, print and knit. 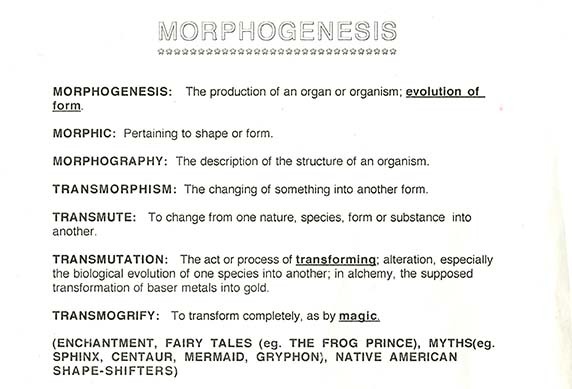 Exert from the brief for the 1998 Fashion Show themed ‘Morphogeneis’, courtesy of Mary Ann Chatterton. At the start of the new millennium, large-scale fashion shows continued, taking place in the Fruitmarket and the Arches. The show moved back to GSA’s Assembly Hall in 2004 and the ‘boutique’ was introduced to raise additional funds. With curriculum change the organisational aspects of the event were integrated into the textile design curriculum. This is still the case today, students work in groups and aspects of the project are delivered by GSA’s Careers Services. Recent shows have provided opportunities to work on live projects with external organisations and companies, or with practising designers. The Students’ Union, renamed ‘The Art School’ continues to be used as the venue for the show, although external sites were used during the development of GSA’s Reid Building. 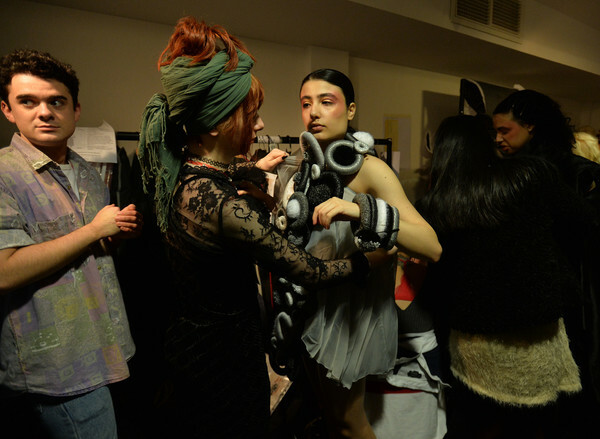 The introduction of undergraduate fashion design at GSA in 2010 has meant that garments by fashion student are shown alongside those produced by textile students. 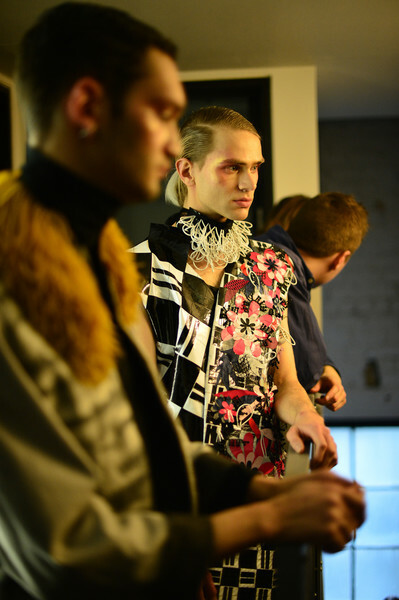 Themes of recent shows have challenged students to consider the role fashion can play in the perpetuation of cultural stereotypes, explored issues of cultural appreciation and addressed gender neutrality. 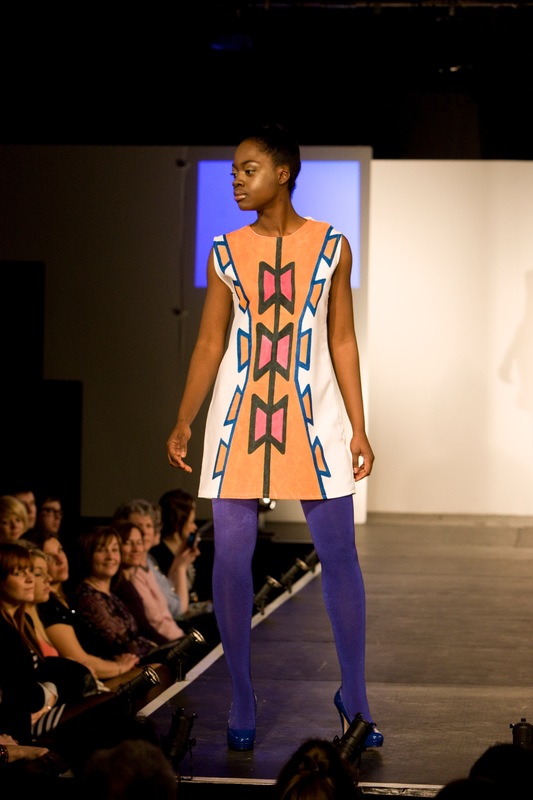 Image from GSA Fashion Show 2010. Image courtesy of GSA’s Flickr Page. 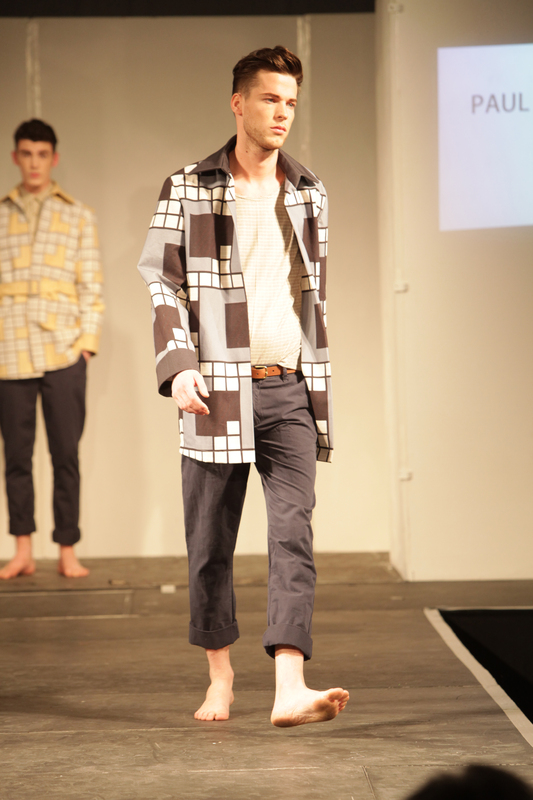 Image from GSA Fashion Show 2011. Image courtesy of GSA’s Flickr Page. Image from GSA Fashion Show 2015. Image courtesy of GSA’s Flickr Page. 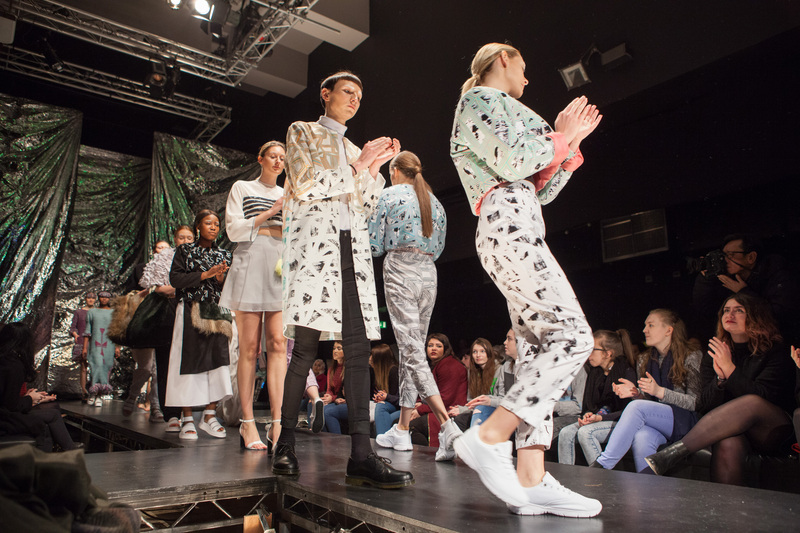 In recent years, students have regularly been influenced by the material in the Archives and Collections when producing garments for the GSA fashion show. For the 70th Anniversary fashion show, 21-22 March, 3rd-year fashion and textiles students selected a period between ‘1947-2017’ for inspiration and below are some of the fantastic final outputs that were achieved. To see more, visit the event’s social media pages on Instagram, Tumblr and Facebook. Backstage at GSA Fashion Show 2017. Image courtesy of GSA Fashion Show 2017 Tumblr. GSA Fashion Show 2017 Tumblr. Special thanks to Helena Britt for supplying text to be used in this post.